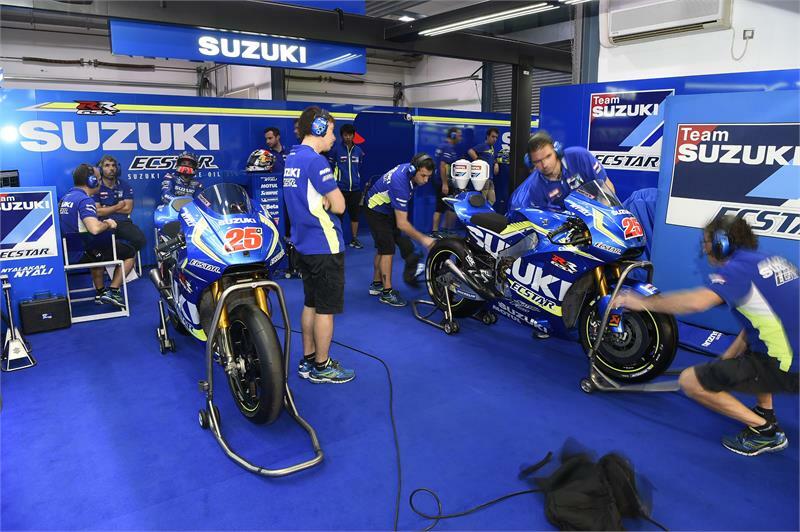 Team Suzuki Press Office – March 3. The second day of MotoGP™ testing in Qatar was another step forward for Team SUZUKI ECSTAR’s Maverick Viñales, who topped the classification with a best-time of 1’55.436 in his 28th out of 42 laps around the Losail circuit. The young Spaniard has been working very hard to finalise the preparation of his GSX-RR, with a step-by-step approach, which has allowed him to stay consistently within the fastest riders. Today he continued the work on the set-up and the electronics, leaving the test of the new ‘up-and-down’ seamless gearbox until tomorrow, but today’s time is already 0.444s faster than his best of yesterday and nearly two-tenths-of-a-second closer to his qualifying time of last year’s debut race. Other positives from tonight for Team SUZUKI ECSTAR were also confirmed by the performance of Aleix Espargaró, who finally regained some feeling with his GSX-RR and began the improvement process that allowed him to perform better. His 1’56.126-lap-time sets him in the 10th place in the classification, but most of the job was done to find a proper setting and work towards the pace as he also focused in the development work of the up-and-down seamless gearbox. After yesterday’s final test with Suzuki Test Team rider Takuya Tsuda, the new gearbox was installed on the #41 GSX-RR, with the experienced Spaniard to have a first taste of it to give further feedback to the Suzuki engineers.